My wife was so frightened that she almost had a stroke! She’d been doing some gardening and ended up right next a paper wasp nest on our fence, which was partly hidden behind a bush. When I did a search online to find rates for removing a wasp nest, the Networx site came up. We got our first phone call just 15 minutes after I submitted a request and within an hour, we received a total of 5 calls from pest control services. I took Multi-Pest Corp, the first contractor who contacted me, though, because I was happy with the price he gave me. He was local, too, which was nice, and could take care of the nest the very next morning. The service was phenomenal. He came exactly when he said he would be here. My wife was the one home, and he explained everything to her about what he was going to do. He made sure she and our pets were inside before spraying the wasp nest extremely carefully. Then he removed the nest, put it in a plastic bag, and took it away. Nobody got hurt in the process and he worked in a very orderly manner. It took him maybe a half hour to take care of the job. Besides being impressively neat and polite, he was very careful not to step on any plants as he walked through the garden. We received a 30-day guarantee against future wasps’ nests on that spot, but we have to keep an eye out for nests being built anywhere on our property. However, he said usually once you destroy the nest, they’ll find somewhere else to go. So far, so good. 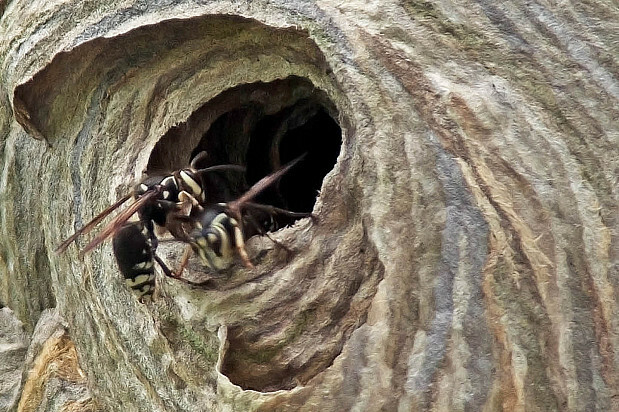 We haven't seen any more nests or wasps around our property. I’d recommend looking for a pest control contractor exactly the way I did it – putting in for the bid and looking for somebody local, especially when you need something done quickly. I’m very happy with the way everything worked out and how Networx worked. So I would definitely suggest doing it that way. Pest Control for Bee Problem so Bad We Were Afraid to Go Outside by Mr. and Mrs. W.
New Low-Maintenance Landscaping To Update Our Yard by LaMerle L.